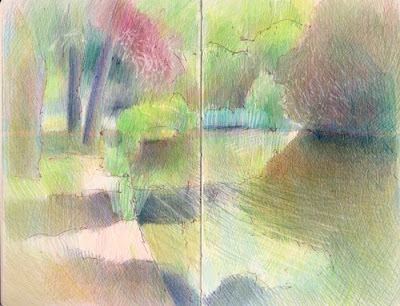 My favourite long walk wends its way between various watery places - the Regents Canal, the Ecology Park Pond, the Hertford Union Canal, the West Lake and the East Lake in Victoria Park. I don't think the conventional view of the East End of London includes lots of green space and water - but that's what I've got! 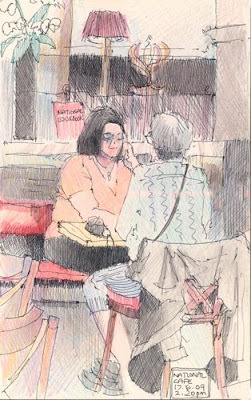 This is a sketch I did on Tuesday this week. This is a view I really like and I'm feeling my way into it - trying to stick to bigger shapes at the moment. 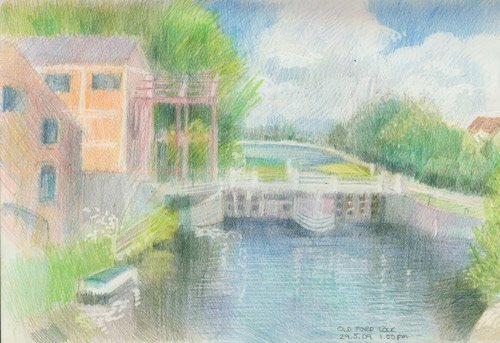 I was sat on my new sketching stool - still liking it - on one of the platforms built into the lake for the anglers. 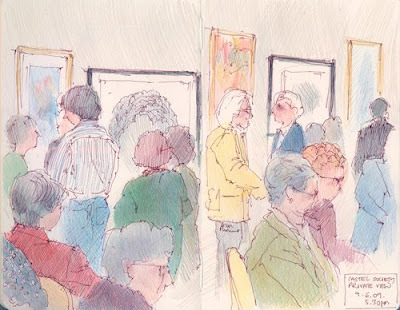 The combination of a long walk and going to the BP Portrait Awards in the evening meant that my Sketchercise total for Tuesday was quite respectable - 11,432 steps and 5.413 miles. Do you know how long it took me to identify this plant? Do you know how completely unhelpful the RHS website is at identifying and providing images of plants in its own gardens? Can you tell I got more than a bit frustrated while trying to identify this plant? That will teach me to forget to photograph the name plate of the plant I'm drawing!!! After nearly an hour of searching on the web and trying out various search terms and plant directories, Ifinally came up with Beschorneria yuccoides - confirmed by the Cambridge Botanic Garden and this site - Cool Tropical Plants which was the most helpful in terms of telling me what it is and how to look after it in layman's terms. Anyway - it's a very spectacular plant and I found it on Weather Hill at Wisley, just near the top entrance to the Vegetable Garden. They've got about 3 or 4 growing up there and it was very spectacular at the end of May when we visited Wisley on that hot bank holiday weekend. I'm toying with doing this one as a formal drawing for next years botanical artists exhibition. You may see it again! 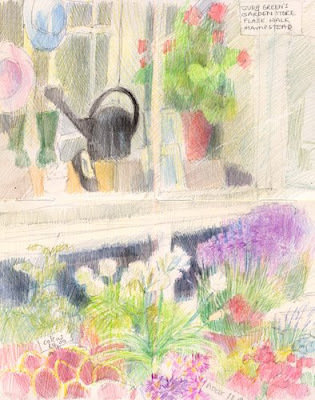 Sketchercise and gardens - I find that visiting large gardens is a really great way to combine walking with sketching - and the bigger the garden the more walking gets done. RHS Wisley is a fabulous garden from this perspective. 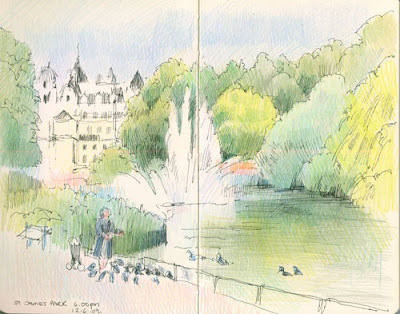 However I wasn't too keen on the bit where I couldn't get reception on my mobile phone so I could ring "he who must not bored while I sketch" who was having a very nice time sat next to the lake with the Sunday papers. 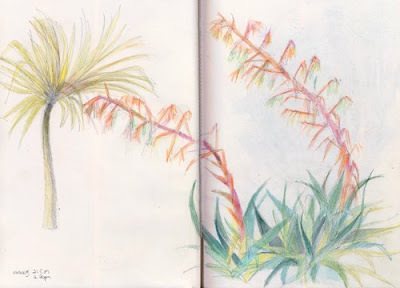 I had to scoot all the way down the hill and across the stream and across seven acres to tell him that we needed to reschedule the planned meet-up....and then had to scoot all the way back up the hill again to get back to my spot for drawing these plants. But I just kept thinking about how it was probably doing me the world of good! 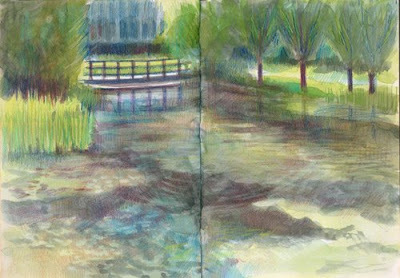 On Thursday I decided to take my sketchercise in the early morning and headed out for the walk up the Regents Canal to the Ecology Park Ponds and Victoria Park. 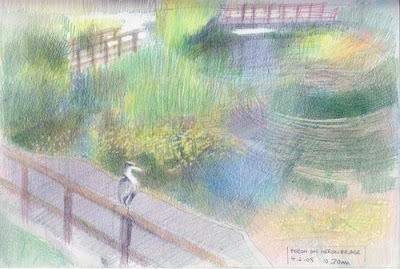 I was waylaid by some very demanding red poppies in the meadow grass of the Art Park but arrived at the Ecology Pavilion Roof at the same time as the heron arrived at Heron Bridge. Below you can see my photo of the heron coming into land on the bridge - he never gives me much warning and I was lucky to get this! I'm afraid I have a habit of giving names to animals and birds that I see often. 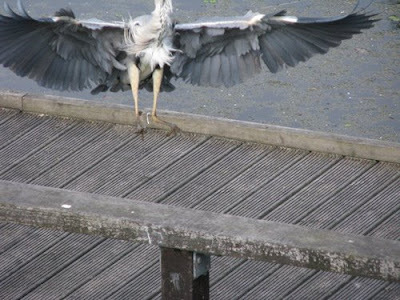 This Grey Heron has been named Herbert the Heron - or "Bert" for short. 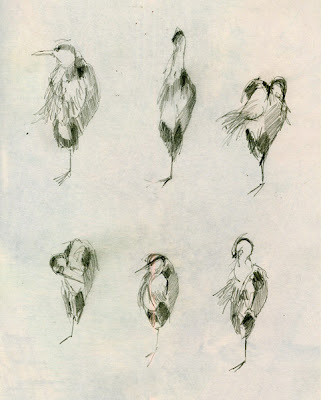 I think it's the same heron I see each time but I could be wrong. He then proceeded to give himself an all over groom - all the time standing on one leg! It took a couple of minutes for me to realise that this was going to take some time and that I could try sketching him as he changed posture - so I did - and you can see the results on the right. Tomorrow I'll post the drawing I did inbetween his changes of posture. 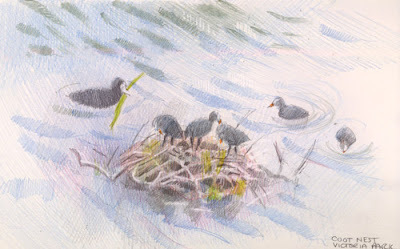 The second drawing (top) is of the coot nest which is right next to the Pavilion Cafe in Victoria Park. 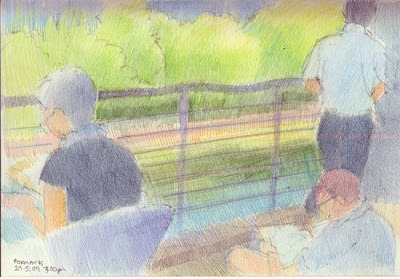 I can sit with my cup of tea on one of the outside benches and sketch this little family which are only about ten feet away. The most difficult bit was trying to work out how the ripples worked as the Mum and Dad busied themselves with housework and looking after the nest - which was of course now needs an extension as their kids are growing up fast and now need more room. I love the way coots seem to find the largest things to put between their beaks so they can add it to their nest on the water. They are the soldier ants of the water birds! 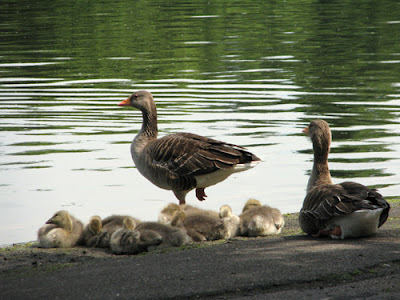 Finally, a photo of the other group of birds which I've grown very fond of in the last few weeks and that's the greylag geese families which live in Victoria Park. The Mums and Dads are most attentive and are often found standing around their brood on one leg, while the babes have a quiet snooze. I think this brood outgrew their nest a while ago! 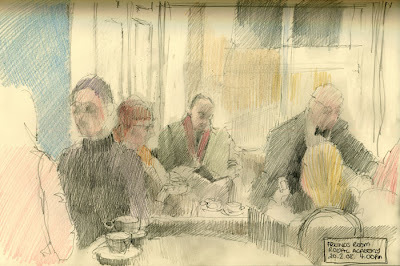 Our final stop on the Drawing London Group outing to East london last Friday was to Formans on Fish Island. Fish Island is an area which is a real backwater in East London - east of the Old Ford area of Bow and north of Old Ford Lock on the canalised River Lea. 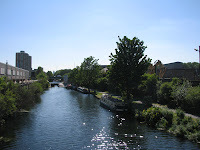 Fish Island is bounded by the River Lea, the Hertford Union canal and the East Cross Route, and is so-called because of its street names (Roach Road, Bream Street, etc). We were visiting Formans which is a brand new restaurant and part of a family of companies all dedicated to smoking and selling fish. How apt therefore to find that it's located on Fish Island! We had the pleasure of visiting their new building last Friday. It's absolutely amazing. The whole building has been constructed on the principle of it being the shape and structure of a slice out of a salmon - and it's a very vivid pink on the outside! 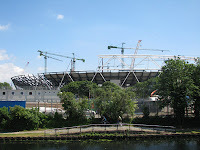 What's interesting about Formans is that their previous home used to be situated right in the middle of what is now the new Olympic stadium. They were the very last company to leave the site and Lance Foreman the Chairman conducted a very long battle to stay as long as they could so that the business would survive and relocate into the new building which was specially built very close to their original site. The process was recently the subject of a BBC2 programme and has also been the subject of a number of newspaper articles such as this one from back in 2005 Up in smoke: The firm that lost out in the Olympics. I guess, at the end of the day, due to the fight they put up they probably didn't lose out. 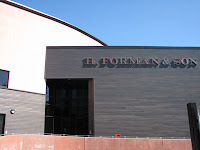 Although apparently at the end, the construction people started building on the site before the firm had left and all the Forman's employees had to be escorted in and out of the ground - in hardhats! H Forman's is Forman's Smokery. It's the oldest established smokery in the UK. It also smokes the salmon differently from the way it's done elsewhere. 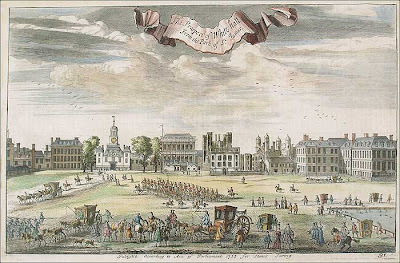 They use a very traditional London Cure which many think is the best there is. We could see down into the commercial kitchen area where they were prepping fish. We were given a guided tour of the operation by Lloyd Hardwick, the restaurant's Executive Chef. and learned that there are three other companies - the restaurant which is new, a venue facility (also new and attracting much interest as it's the nearest one to the Games site!) and an online food delivery for its gourmet food products which has been going for a little while (check out the smoked fish!). So what you may say. Well I would do too - until I recognised a packet of their salmon - which I'd last seen on display in Fortnum and Masons in Piccadilly and they only stock the very best. It turns out that Formans also ship their smoked salmon to top class hotels all around the world all round the world from Bangkok's Oriental to Sandy Lanes in Barbados. So if you've ever been fortunate to eat any this is where it comes from! Lunch was simply wonderful - as you can see from the photo. 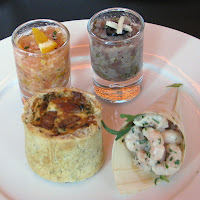 These were the starters and they were followed by a Gourmet Fish Stew with mustard mash for my main course. For which I have one word - Yummy! Having eaten a simply splendid lunch I wasn't at all surprised to learn, when I looked at the website later, that Lloyd had learned his craft from the Roux Brothers and subsequently became the first Executive Chef of The Tate Modern. It was great to see a photographic exhibition in the restaurant - photographs of all the industries and companies which were displaced when the Olympics moved in. At the top and below you can see a couple of my quick "after lunch" sketches - when everything suddenly seemed to simplify much more easily into large shapes! 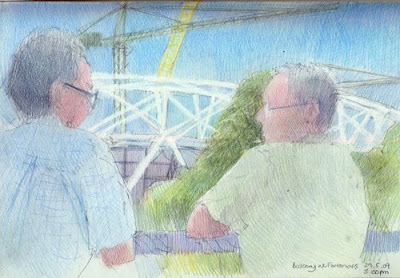 All in all it was a splendid day out sketching, walking and eating. ...and at the end of the day out, all that was left to do was for me to walk home - down the very peaceful and almost rural Hertford Union Canal. 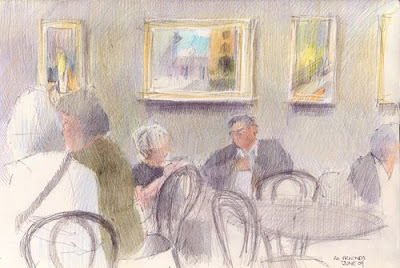 Formans - the restaurant. 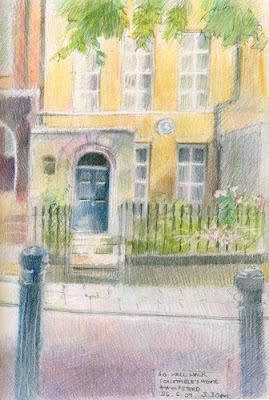 Stour Road, Fish Island, London E3 2NH – Free Parking available. Forman & Field - the fine food mail order company specialising in fresh, traditional British produce from small, independent producers.